Today's edition of "A World of Hockey" finds us in the land down under, Australia...Western Australia to be precise. I find it an interesting time for Australian hockey considering at this most recent NHL Entry Draft, we saw the Washington Capitals select forward Nathan Walker 89th overall, becoming the first Australian-born player to be drafted into the NHL. 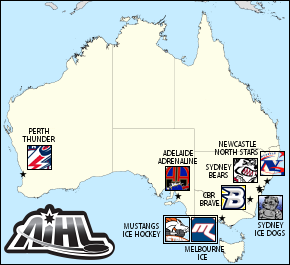 The Perth Thunder are one of 8 total teams competing in Australia's top, semi-professional, league, the Australia Ice Hockey League (from now on referred to as the AIHL). The Thunder was founded in 2010, and later that year were able to gain a provisional license to begin play in the 2011 season, so it's a rather young team! They play their home games in Perth Ice Arena. Their General Manager, Stan Scott, also served as the team's head coach from 2012-2013, stepped down for a few months (April-May) in 2014, and is resuming his role as a head coach later that year (2014). Their colors are red, blue, and white, and feature red based home jerseys, and white based away jerseys. The Perth Thunder are named after the city they play in, Perth...yup. But on a more serious note, it looks like the name, Thunder, is named after the 2010 Western Australian storms, which swept through cities in south-western Australia. The storms ended up causing over $1 Billion in repairs, the most expensive natural disaster in Western Australian history. I'm not sure how true this may be, but considering that the storms occurred in March of 2010 and the team was founded in later that same year, I'm pretty sure it's no coincidence. Over the 3 year history of the franchise, they have only made the playoffs once, in 2013. (The AIHL season plays from mid-April through late August/early September of the same calendar year) Their record for last season, the 2014 campaign, was 9-15 with 2 SO wins and 2 SO losses. This was a bit of a drop-off from making it to the semi-finals of the playoffs the season before (their record then was 17-9 with 1 SO win and 1 SO loss). The team's captain is Australian-born forward, Samuel Wilson. The alternate captains are Canadian-born forward, Daniel Ruck, and New Zealand-born forward, Andrew Cox. The Thunder's leading goal scorer from last season, Stuart Stefan, scored 44 points (14G 30A) in 28 games. The Thunder's second leading scorer was Justin Fox, who had 40 points (20G 20A) in just 21 games last season. You can find more information about the team stats over at the EliteProspects page, and at The AIHL player stats page. Looking at the roster, there looks to be 23 players. Of those 23, only 8 were born in Australia. In total there are 16 players on the team who are Australian citizens. The countries from where the other 7 players are from are New Zealand, USA, Canada, Finland, and UK. While the team may not do live video streams of their games, they have very active social media accounts. The above video is from the Perth Thunder's Official Youtube Page, to which I will link later below. While the population of Australia is very skewed towards the Eastern coast, is there a possibility of adding another team along the West coast, near Perth? Just some food for thought.